Advancements in technology, the Internet and social media have allowed businesses to capture greater amounts of quantitative data than ever before. And with business decisions becoming increasingly evidence-based, the need for experts who can derive insights from in-depth analysis of this data and bridge business and technology is growing as well. Every business can benefit from becoming more data-driven. It helps them understand their clients, perform internal operations more efficiently and guide decision-making. It’s one thing to look at data and see why something happened in the past, but it’s another to use it to predict what will happen in the future. Those who can do the latter will likely be the future leaders of their business as more companies rank predictive analytics and business intelligence near the top of their priorities. For example, insurance firms derive key insights for policy and claims management that help reduce risk and improve underwriting processes. 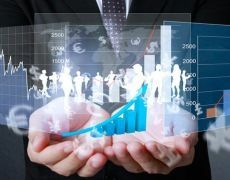 The financial efficiencies that business analytics provide insurance firms with can significantly improve operations and drive overall company growth. Similarly, health care providers can use predictive analytics to help minimize expenses, such as the cost of unnecessary tests, by drawing conclusions from the data-supported nuances in patient behavior, resulting in more accurate analysis and fewer liabilities to manage. The 2013 Gartner Financial Executives International CFO Technology Study found that “15 of the top 19 business processes that CFOs have identified as requiring improved technology support are largely addressed by [business intelligence], analytics and performance management technologies.” The top business process area that the CFOs surveyed said needed investment is facilitating analysis and decision-making (59 percent), followed by the ongoing monitoring of business performance (50 percent), and then collaboration and knowledge management (45 percent). With the use of data becoming increasingly important to businesses, it is even more vital for them to have the resources available to analyze and interpret it to add context and meaning. Fortunately for data analysis professionals, data isn’t actionable without that human element. They fill an important role in coordinating collaboration within their organization, and must be multidisciplinary in their problem-solving approach to communicate their analysis across departments. The Villanova School of Business understands these emerging trends and has designed its online Master of Science in Analytics program to develop professionals into business analytics leaders. The comprehensive and rigorous curriculum was developed in consultation with the business community to address the skills most urgently needed, from data collection and analysis through implementation and application.